Greetings fellow ice cream lovers. Ever since my field trip to Ben & Jerry's, my wife has been wanting to make the trip herself. Sure it's a four hour voyage, but it's not like we get to travel much, in fact, we haven't really attempted a vacation since taking our daughter to Disney almost 3 years ago. It's Vermont, and it's not leaf peeping season or ski season, so we didnt plan on staying a week, we just wanted to see if we could take our first long weekend trip as a family of four. Ok, maybe I'm not starting this story very well. I always have trouble when I have seventeen points to make and they all trying coming out at once. Let's recap the old fashion way to get started. We head up to VT. We stopped at the Real Good Toys Dollhouse outlet... it's not what you call a "big" place... "immensely tiny" might be more appropriate. We headed back to Route 89 and stopped at that place of places, Ben & Jerry's Waterbury plant. The original plant that is the mecca for us ice cream addicts. Problem is, the tour wasn't quite the same as the blogger tour I took. More on this later because it involves a call to Ben & Jerry's PR group. Looking for a happy way to wrap up our day, we zoomed up 89 and down Route 7 to the Vermont Teddy Bear Factory. We took the 4 o'clock tour with one other family. Unfortunately, production had already wrapped up for the week (it is late Friday afternoon after all). Our daughter had fun learning about the teddy bears and baby boy had fun wandering around making new friends with the few employees who were finishing up their days. Now originally we were suppose to head up to Vermont on labor day weekend, but due to a production break, we postponed for one week. Lucky for us, that meant we came during this year's SEABA Art Hop. In particular, we checked out the Kid's art hop put on by Davis Studios. Our daughter had a great time so a big thanks to them for sponsoring this new part of the art hop. Wanting to be responsible, educational parents, and hoping to give baby boy a new experience, we hit up ECHO Lake Aquarium and boy would I like my $30 back. We saw a few fish from Lake Champlain, a few frogs and turtles, a snake, oh, and an eel hiding under a branch. While the aquarium is modern and well kept, it was immensely boring. It's my own fault I guess for not reading up more closely. The highlight was probably the weather reporter exhibit. Reeling from the aquarium but determined to enjoy a most beautiful day, we headed for Church Street marketplace. Basically four blocks of outdoor shopping, and do you know what's near the north end of the marketplace? Ben & Jerry's flagship store. Baby boy fell asleep in his stroller, so I kept him outside while my wife & daughter spent a literal 20 minutes getting us all some ice cream. The good news is that the Milk & Cookies milkshake was fantastic (imagine a chocolate, cookies & cream flavor to the milkshake) --- CMP also had activities this weekend. There was music, a magician, painted cow statues, and we even let our daughter pick up a small print for her room from a local artist. Well, Sunday didn't go to well. Baby boy was pretty much awesome up 'til now but it looks like we wore him out. He must have reached a milestone because he's never as been so friendly and outgoing as he was this weekend. Unfortunately, he woke up super early Sunday morning, was super cranky, and kept going for the door and saying "go car". We decided to pack it up and head home early. We will miss Vermont with it's fresh air, beautiful terrain, and less stressful atmosphere. Overall it was a good practice run for us. It was still tiring, and there were hiccups, but overall I think it went surprisingly well. WAIT WAIT WAIT, what about Ben & Jerry's??? Oh yeah, now that I got all the fluff out of the way, I need to talk about what you really want to know. I think two things have been well established on this blog. First, I love snacking and in particular I LOVE ice cream. Second, I was deeply enamoured with Ben & Jerry's after they spoiled me for three days. I already loved them to begin with, but then to be spoiled by one of my favorite companies, well, how was I suppose to react? Seeing all of my excitement and energy when I returned from the blogger bash, my wife has long wanted to take a trip to Waterbury. It's just one of those things you do. It wont change the world and it wont change you, but let's call it a bucket list item that needs to be done. Now I contacted Ben & Jerry's PR group before heading up because I wanted to do the trip right. I discovered that production had been halted for the long labor day weekend, so we bumped our visit 'til the following friday. I mean, what's the point of driving four hours just to NOT see production. Well, we got to the plant and bought four tickets for the 2:30 tour. It's not really expensive, it's just 3 dollars for adults and the kids are free (as it should be). Now keep in mind I am coming in as random anonymous daddy guy, not mr. fancy pants blogger guy. As we stand there waiting, my wife hears that there is no production today. I tell her that they said there should be, but I never checked back in to verify (the room was booked and vacation days had been taken, it was too late to change). The tour begins and our tour guide starts with the jokes, but the jokes are a little, ummm, unexpected. Ahh, maybe he's just trying to break the ice because there is indeed no production today. Bummer, five months of waiting and production is down. Egg on my face... anyway, we watch the movie and then head onto the mezzanine to see the production floor being cleaned. There is a video that shows the floor when production is running and our tour guide is keeping the stories flowing, but something isn't right. You see at first our tour guide just seemed to have a very dry, sarcastic sense of humor but we started to realize that he's not being silly, he's being serious. He's... dismayed shall we say because production isn't running for us to see. He's spent a huge part of his life making ice cream, and here he is giving a tour that just shows his fellow coworkers scrubbing everything down (at least it's nice and clean down there). He mentions that the newer, better, bigger, stronger, faster plant to the north is where all the cost-effective ice cream making action is. All in all, it's a bit depressing really. Part of it is because I feel like I've disappointed my family, and the other part is that I've disappointed myself. During my April visit when production was humming, everyone had a smile on their face. Now, I'm standing here confused. What has gone wrong? Totally unsettled, I put an email into Ben & Jerry's and we arranged to have a meeting on the phone. I will honestly admit that there was part of me that didn't even want to bring up my trip, and that point was reinforced by my wife who started thinking "well, maybe he was having a bad day, we don't want anyone to lose his job". I mean, it's totally possible that we just overreacted. 99.999% of people haven't been spoiled like I was, so maybe it's just that. Well, I'm a blogger so I need to tell my story, but before I begin, it's time to talk with PR and have them help put everything back into context. Ok, let's see if we can put this conversation in a useful order. Second, it's important to keep in mind that these people have been making ice cream for a long time and it's what they love to do. We all want to be busy and do our part in life. I know I get frustrated when I can't do my job, so why shouldn't they be passionate about not doing theirs. Also, it helps to know these people are still employed and still getting their weekly paycheck regardless of whether production is running or not. Ben & Jerry's does their best to keep everyone as full time employees. When production is running six days a week, OVERTIME! When production is 4 days a week, well, they try to retask people as much as possible to keep them busy. Third, there are conversations going on about how to keep Waterbury running and I'm going to encourage you to hound Ben & Jerry's to keep them focused on figuring out this issue. If you go to the plant and production is down and you're bummed, let them know. Send emails. Give them a sign and let them know how important it is to actually see our favorite stuff get made. It's funny to think about it from a business and efficiency angle, but you really do have to start thinking things like which flavors are most cost effective in waterbury, can they run at least one line at a time, can they pace themselves differently, all that stuff. We were there for about an hour and saw two tour buses come in. PR mentioned that 12-20 buses might stop in a day during peak (leaf peeping) tourist season. That's A LOT of people who are kind of counting on ice cream being made. So, while I was pretty freaked out, Ben & Jerry's helped me put things back into perspective. They reminded me of something I had heard at the blogger bash: "if a business isn't growing, it's dieing". That really is the truth and just reinforces what I learned. As great as they may be, they are still just a company, a living, breathing, non-magical company that has good intentions but still needs to play by the rules of capitalism. 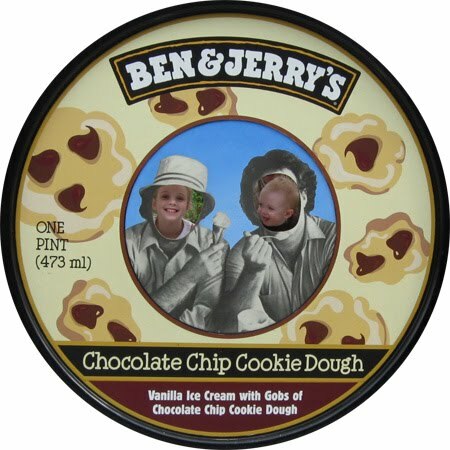 Ben & Jerry's needs to grow and be competitive and sometimes that means I don't get to see ice cream being made. Yes, it's a shock. Yes, I'm still bummed. Will we head back again? Hopefully someday. Maybe if they are having a big event we can go back up and report back to everyone. Now keep up the good fight Ben & Jerry! and please keep that Waterbury plant cranking! Note: we actually had a few signals get crossed so I missed out reporting on the caring dairy event they had Saturday, so my apologies for that.